TLJ News: April June 26-30, 2005. 6/30. The National Telecommunications and Information Administration (NTIA) released a document titled "U.S. Principles on the Internet’s Domain Name and Addressing System". With this document, the US restates that it will retain control of the domain name system (DNS). The document does not reference the United Nation's (UN) Working Group on Internet Governance (WGIG), or UN's forthcoming event titled "World Summit on the Information Society", to be held in Tunisia in November. The document does not even reference the UN. However, the WGIG has announced that it will release a report on July 18, 2005. The UN will likely propose to limit US authority over the DNS. The UN has no authority or ability to take control of the DNS away from the US. The WGIG has published in its web site comments that it has received regarding internet governance. For example, Syria submitted a comment [PDF], and Saudi Arabia submitted a comment [PDF], proposing to shift internet governance from the US to a UN body. In contrast, the Internet Governance Task Force of Japan submitted a comment [PDF] to the WGIG in which it argued that "in principle there isn't need for an additional arrangement nor body. Whenever we have had issues regarding the Internet, individuals or organizations that thought it necessary to address those issues have been able to do so voluntarily and cooperatively. To date, collectively we have been able to solve those issues. Such dynamic and open processes enable the right people to be in the right place to address the issues that concern and involve them at the right time. This is how the existing ``distributed governance architecture´´ was made up, which has worked very well so far, and will work well in the future if and when any new issues emerge." The NTIA document is diplomatic. It does not state, for example, that the Bush administration does not want Bashar Assad and other corrupt and technophobic dictators to share control of the DNS or internet governance. Michael Gallagher (at left), the head of the NTIA, gave a speech on June 30 at a Wireless Communications Association International (WCAI) conference in which he discussed, among other topics, the NTIA document. See, presentation slides [PDF]. This presentation states that "The Bush Administration intends to preserve the security and stability of the Internet's domain name system (DNS), continues to support ICANN and will work with the international community to find appropriate ways to address Internet governance issues." The Information Technology Association of America (ITAA) submitted a comment [PDF] to the UN's WGIG in which it argued against creating a new internet governance body. Also, after the NTIA released its document, ITAA President Harris Miller promptly stated in a release that "The Bush Administration has gotten the issues of Internet governance exactly right". The four paragraph NTIA document provides, in full, as follows: "The United States Government intends to preserve the security and stability of the Internet’s Domain Name and Addressing System (DNS). Given the Internet's importance to the world’s economy, it is essential that the underlying DNS of the Internet remain stable and secure. As such, the United States is committed to taking no action that would have the potential to adversely impact the effective and efficient operation of the DNS and will therefore maintain its historic role in authorizing changes or modifications to the authoritative root zone file." The Internet Corporation for Assigned Names and Numbers (ICANN) will meet in Luxembourg on July 11-15, 2005. See, notice and agenda. 6/30. The Government Accountability Office (GAO) released a report [35 pages in PDF] titled "Identity Theft: Some Outreach Efforts to Promote Awareness of New Consumer Rights Are Under Way". This report was required by the Fair and Accurate Credit Transactions (FACT) Act of 2003. The FACT Act contained minor amendments to § 609(e) of the Fair Credit Reporting Act (FCRA) to assist victims of identity theft. The report notes that the FACT Act "established the right of identity theft victims to obtain, within 30 days, copies of business records involved in transactions alleged to be the result of identity theft. Further, the FACT Act requires that FTC develop a model summary of rights to be distributed to consumers who believe that they are victims of identity theft -- including the right to obtain information available to them under section 609(e). Additionally, the act requires FTC to establish and implement a public media and distribution campaign on identity theft prevention by December 2005." This report states that the GAO is unable at this time to assess the effectiveness of the § 609(e). However, the report finds that "As of June 2005, a number of outreach efforts to consumers, businesses, and local law enforcement agencies on identity theft prevention and remediation by federal regulatory and enforcement agencies and others were under way." It further finds that "Law enforcement agency officials and consumer advocacy group representatives stated that section 609(e) should help victims remedy the effects of identity theft. Law enforcement officials noted that the provision would allow victims to build stronger cases that could prompt local police agencies to open an investigation and added that the information would be useful in identifying patterns or trends in identity theft practices. Consumer advocacy groups told us that they believed that the new provision should make local police more willing to take reports on identity theft because these reports could be used to substantiate the victim’s access to information." 6/30. The Senate approved S 1307, the "Dominican Republic-Central America-United States Free Trade Agreement Implementation Act", by a vote of 54-45. See, Roll Call No. 170. In addition, the House Ways and Means Committee approved HR 3045, the "Dominican Republic-Central America-United States Free Trade Agreement Implementation Act". This free trade agreement was signed by representatives of the participating nations on August 5, 2004. See especially, sections pertaining to Telecommunications [PDF], Electronic Commerce [PDF], and Intellectual Property Rights [PDF]. President Bush released a statement: "I appreciate the bipartisan support in the United States Senate for the CAFTA-DR agreement, which is good for American workers, good for our farmers, and good for small businesses. When passed, it will eliminate trade barriers immediately on 80% of US-made goods and the rest within a few years, which will help increase sales abroad and job creation at home. The agreement is also a strong boost for young democracies in our own hemisphere, whose success is important for America's national security and for reducing illegal immigration." Robert Portman, the U.S. Trade Representative (USTR), stated in a release that "While the momentum for CAFTA-DR is clearly building, and we're drawing more and more support from all sides, the debate will continue when the House returns after the July 4th recess. I look forward to working to build towards successful passage in July." Sen. Charles Grassley (R-IA), the Chairman of the Senate Finance Committee, stated in a release that "This agreement levels the playing field for U.S. exporters. Farmers, ranchers, manufacturers, and service providers in Iowa and nationwide will get a better trade deal in CAFTA countries than what they have today. "Six months ago people said this agreement was a non-starter. Now a majority of senators think it’s a no-brainer. It’s halfway to becoming the law of the land. A strong Senate vote gives momentum for a solid House vote. It looks like the President will have the bill on his desk this summer." 6/30. The Department of Justice (DOJ) announced in a release that "the FBI and law enforcement from 10 other countries conducted over 90 searches worldwide as part of ``Operation Site Down,´´ designed to disrupt and dismantle many of the leading criminal organizations that illegally distribute and trade in copyrighted software, movies, music, and games on the Internet." In addition, Attorney General Alberto Gonzales gave a speech. He stated that "Operation Site Down is one of the largest international law enforcement actions to date dedicated to stopping intellectual property theft on the Internet. Our objective in this operation was to find and dismantle large-scale criminal enterprises that illegally obtain, copy, distribute, and trade in copyrighted software, music, movies, and video games." He stated that this operation has "dismantled more than eight major online distribution servers for pirated works -- a distribution network that provides the vast majority of the illegal digital content now available online. In the United States, four individuals have been arrested and charged with criminal copyright infringement violations. 25 U.S. Attorney’s Offices and 32 FBI field offices worked to obtain and execute the search warrants." Gonzales added that "By penetrating this illegal world of high-technology and intellectual-property theft, we have shown that law enforcement can find and prosecute those who try to use the Internet to create piracy networks beyond the reach of law enforcement." 6/30. President Bush nominated Robert Mosbacher to be President of the Overseas Private Investment Corporation. See, White House release and release. 6/30. President Bush designated Cynthia Glassman (at right) to be acting Chairman of the Securities and Exchange Commission (SEC). She replaces William Donaldson. President Bush has already nominated Rep. Chris Cox (R-CA) to be an SEC Commissioner, and will designate him the Chairman of the SEC. See, White House release. 6/30. President Bush nominated Rep. Chris Cox (R-CA) to be a Commissioner of the Securities and Exchange Commission (SEC), for a term expiring on June 5, 2009. See, White House release. President Bush previously announced that he would make this nomination. See, story titled "Rep. Cox to Replace Donaldson as SEC Chairman" in TLJ Daily E-Mail Alert No. 1,146, June 2, 2005. 6/30. President Bush nominated Robert Kimmitt to be Deputy Secretary of the Treasury. White House release. 6/30. President Bush nominated Julie Myers to be Assistant Secretary of Homeland Security for the Bureau of Immigration and Customs Enforcement. She is currently Special Assistant to the President for Presidential Personnel. She was previously head of enforcement at the Bureau of Industry and Standards (BIS). Before that, she was Chief of Staff of the Department of Justice's (DOJ) Criminal Division. This was when Michael Chertoff was the Assistant Attorney General in charge of the Criminal Division. Chertoff is now head of the Department of Homeland Security. See, White House release. 6/30. Joseph Hall will leave the Securities and Exchange Commission (SEC). He was the Managing Executive for Policy and a member of former Chairman William Donaldson's senior management team. He will return to the law firm of Davis Polk & Wardwell. See, SEC release. 6/30. Peter Derby will leave the Securities and Exchange Commission (SEC) at the end of July. He is the Managing Executive for Operations and Management. See, SEC release. 6/30. Matt Well will leave the Securities and Exchange Commission (SEC). He is the Director of the Office of Public Affairs. See, SEC release. 6/30. President Bush nominated Michael Garcia to be the U.S. Attorney for the Southern District of New York for the term of four years. If confirmed, he will replace James Comey, who is now the Deputy Attorney General at the Department of Justice (DOJ). See, White House release. 6/30. President Bush nominated John Redd to be Director of the National Counterterrorism Center at the Office of the Director of National Intelligence. See, White House release. 6/29. The Federal Communications Commission (FCC) announced comment deadlines for the notice of proposed rulemaking (NPRM) portion of its order and NPRM regarding the extension of 911/E911 regulation to interconnected voice over internet protocol (VOIP) service providers. The FCC adopted, but did not release, this order and NPRM at its meeting of May 19, 2005. See, story titled "FCC Adopts Order Expanding E911 Regulation to Include Some VOIP Service Providers", and stories titled "Summary of the FCC's 911 VOIP Order", "Opponents of FCC 911 VOIP Order State that the FCC Exceeded Its Statutory Authority", and "More Reaction to the FCC's 911 VOIP Order" in TLJ Daily E-Mail Alert No. 1,139, May 20, 2005. The FCC released the text [90 pages in PDF] of this order and NPRM on June 3, 2005. See, story titled "FCC Releases VOIP E911 Order" in TLJ Daily E-Mail Alert No. 1,148, June 6, 2005. Initial comments are due by August 15, 2005. Reply comments are due by September 12, 2005. This is a "permit but disclose" proceeding. The NPRM seeks comments on numerous topics. First, it notes that "there is no way for portable VoIP providers reliably and automatically to provide location information to PSAPs for these services without the customer’s active cooperation". Hence, it asks, how can the FCC mandate that service providers provide location information, in a manner that does "not depend on a customer providing his or her location information"? The NPRM suggests that the FCC is considering mandatory registration of all wireless access points, mandatory registration of all access jacks, various methods of signal triangulation, and mandating GPS systems. Some of the potential technologies for obtaining location information would entail requiring equipment manufacturers to redesign their products. Hence, the NPRM further asks what statutory authority the FCC has to require consumer electronics manufacturers to incorporate location technology into personal computers and other devices. The NPRM asks if the FCC should broaden the scope of these rules to other providers of VOIP services. The NPRM asks "How should the use of wireless broadband connections such as Wi-Fi or WiMax impact the applicability of the obligations we adopt today? Would providers of wireless interconnected VoIP service be more appropriately subject to our existing 911/E911 rules for CMRS?" The NPRM asks about expanding the reporting requirements for interconnected VOIP service providers. The NPRM also asks what role state regulators should play in regulating interconnected VOIP service providers. The order and NPRM is numbered FCC 05-116 in WC Docket No. 05-196. The FCC issued its order and NPRM following its original NPRM, which was FCC 04-28 in WC Docket No. 04-36, and titled "In the Matter of IP-Enabled Services". However, the FCC's June 29 notice states that comments should reference only WC Docket No. 05-196. 6/29. The House Government Reform Committee held a hearing titled "To Lead or to Follow: The Next Generation Internet and the Transition to IPv6". This was the first House hearing devoted solely to issues associated with the transition to IPv6. Karen Evans, the Administrator for Electronic Government and Information Technology at the Office of Management and Budget (OMB), stated that the OMB will require that federal agencies' infrastructure must be using IPv6 by June 2008. Internet Protocol version 6 (IPv6), which is currently replacing IPv4, provides a vastly increased number of internet addresses. It also provides for more efficient and faster routing, enhanced mobility features, and improved security, for example, through authentication. The two hour hearing focused on numerous issues, including what are the benefits of IPv6, what is the current availability of IPv4 numbers, what security threats does the transition pose, what should the U.S. government do to assist the transition (such as government regulations and mandates, government funded research, and government management of transitioning its own facilities), what are the consequences for the U.S. economy and U.S. world leadership, and what are the national security implications. The Committee heard from two executive branch officials, two Congressional witnesses, and four private sector witnesses. See, prepared testimony [PDF] of Karen Evans (OMB, Executive Office of the President) and prepared testimony [PDF] of George Wauer (Director, Architecture & Interoperability, Office of the Assistant Secretary of Defense for Networks and Information Integration and DOD Chief Information Officer, Department of Defense). See also, prepared testimony [PDF] of David Powner (Director of Information Technology Management Issues, Government Accountability Office) and Keith Rhodes (Chief Technologist and Director, Center for Technology and Engineering, GAO). The GAO is an arm of the U.S. Congress. See also, prepared testimony [PDF] of John Curran (Chairman of the American Registry for Internet Numbers), prepared testimony [PDF] of Jawad Khaki (Microsoft), prepared testimony [PDF] of Stan Barber (Verio), and prepared testimony [PDF] of Alex Lightman (Charmed Technology Inc.). Government Actions. The OMB's Karen Evans was the lead off witness. She wrote in her prepared testimony [PDF] that "The overarching challenge facing us is ensuring continued uninterrupted functionality of Federal agencies during the transition while providing continued and improved information assurance. This will require major changes in the architecture of many agency networks. Since there is a large embedded base of IPv4-compatible equipment and applications, transitioning to IPv6 will also require large capital investments and labor resources." She said that "we are about to issue a policy memorandum providing guidance to the agencies to ensure an orderly and secure transition to IPv6." Rep. Tom Davis (R-VA), the Chairman of the Committee, presided. He said in his opening statement that "to reap the benefits from IPv6 federal agencies must first begin to plan and develop requirements that will take full advantage of what the new protocol offers. I hope that the Office of Management and Budget will continue its leadership role in information policy and begin to address some essential issues, including how much IP address space the federal agencies may require, whether the federal government is ready for the transition, and how much it will cost." Rep. Davis repeatedly asked witnesses, "Are we behind the eight ball?" This is American slang for being in a disadvantageous or uncomfortable position. In the pool game of eight ball, the ball with the number eight must be sunk last. He received a wide range of responses. One, and only one, witness advocated Congressional legislation. He argued that the Congressional should mandate transition by all federal agencies by 2010, create a leader and agency for the IPv6 transition, and provide this agency with funding of about $50 Million per year. Lightman also railed against patents related to IPv6. The OMB's Evans said that the U.S. is following a market based approach. Microsoft's Khaki said that "market forces should lead the transition", but that the government should fund research, and lead through the government procurement process. Current Availability of Numbers. The current 32 bit IPv4 numbering system yields a quantity of unique internet protocol addresses of about 4.3 times 10 to the 9th power (about 4.3 Billion). The new 128 bit IPv6 numbering system yields about 3.4 times 10 to the 38th power unique addresses. The GAO's Powner wrote in his prepared testimony that this "means that almost any electronic device can have its own address. While IP numbers are commonly associated with computers, they are increasingly being assigned to other items such as cellular phones, consumer electronics, and automobiles." The ARIN's Curran testified that due to more efficient use of IPv4 numbers, "there is ample" time for the transition to IPv6, and "there is not a crisis per se". He said that the ARIN has been allocating IPv6 numbers since 1999, and that the IPv4 numbers will not run out until about 2018. Charmed Technology's Lightman disputed Curran's statements. He argued that the numbers are not running out because of restrictions being imposed by address managers, such as the ARIN. For example, he asserted that the ARIN only gives out blocks of numbers to entities who business plans it approves. He also asserted that there are inefficient, Soviet style, restrictions on use. Transition Related Security Threats. The GAO's Powner testified that the transition to IPv6 "is similar to Y2K", but without the hard deadline. The DOD's Wauer said that the DOD is following the Y2K model, and that it will be successful. Keith Rhodes of the GAO testified solely about security threats associated with the transition to IPv6. The GAO's prepared testimony states that "As IPv6-capable software and devices accumulate in agency networks, they could be abused by attackers if not managed properly. For example, IPv6 is included in most computer operating systems and, if not enabled by default, is easy for administrators to enable either intentionally or as an unintentional byproduct of running a program. We tested IPv6 features and found that, if firewalls and intrusion detection systems are not appropriately configured, IPv6 traffic may not be detected or controlled, leaving systems vulnerable to attacks by malicious hackers." See also, U.S. Computer Emergency Response Team (US-CERT) document [PDF] titled "Malware Tunneling in IPv6". U.S. Economy and U.S. World Leadership. The GAO's Powner wrote in his prepared testimony that "Interest in IPv6 is gaining momentum around the world, particularly in parts of the world that have limited IPv4 address space to meet their industry and consumer communications needs. Regions that have limited IPv4 address space, such as Asia and Europe, have undertaken efforts to develop, test, and implement IPv6 deployments." For example, Powner wrote, "the Japanese government's e-Japan Priority Policy Program mandated the incorporation of IPv6 and set a deadline of 2005 to upgrade existing systems in both the public and private sectors. The government has helped to support the establishment of an IPv6 Promotion Council to facilitate issues related to development and deployment and is providing tax incentives to promote deployment. In addition, major Japanese corporations in the communications and consumer electronics sectors are also developing IPv6 networks and products. Microsoft's Khaki also wrote about the transition in Asia. He wrote that "Japan is a particularly good example of active government involvement in IPv6 deployment. In September 2000, Prime Minister Mori Yoshiro made IPv6 a national priority, and by early 2001 Japan had initiated an "e-Japan" strategy that specifically called out the need for government support of IPv6 networks. Since that time, Japan has used cooperation with other Asian nations, economic incentives, policies supporting network security and consumer privacy, deregulation, and the digitization of government to help promote its IPv6 efforts to great effect. This strong push has prompted Japan's commercial sector to respond with rapid advances in network technologies and devices. We anticipate that Japan will roll out robust, commercial IPv6 networks capable of supporting tens of millions of broadband subscribers over the next few years. This Japanese effort is in many ways akin to the US government and industry partnership seen most prominently during the early development of the Internet." Khaki added that in the U.S. "it appears that private industry efforts are working well at this early stage of IPv6 planning and deployment; companies continue to support IPv4, increasingly provide IPv6 compatibility, and many are preparing for an eventual transition to an IPv6 network." Verio's Barber said that developments in Asian demonstrate the "clear recognition by policymakers abroad of the potential of IPv6", but do not warrant government mandates in the U.S.
Rep. Davis raised the subject of whether the "US is at competitive risk with respect to the Next Generation Internet", and expressed concerns about the People's Republic of China. And, he asked witnesses whether the U.S. is "behind the eight ball". Others took an alarmist view of developments in Asia. Rep. Brian Higgins (D-NY), a first term Representative from Buffalo, New York, stated that the "U.S. position of leadership is eroding", and that "there is economic troubles, currently, and on the horizon". Lightman offered this argument in his written testimony. "Over $9 trillion of America’s nearly $13 trillion economy relates to services, subscriptions, and transactions, and IPv6 will help keep the trust and keep hundreds of millions of customers loyal to American companies. If we don't show leadership in the New Internet, we get a loss of millions of jobs and market share across thousands of companies. A loss of public trust and reputations in transactions over U.S. networks using the existing, highly vulnerable IPv4 protocol, coupled with an increase in trust of IPv6 networks in Japan, Korea, China, and the 25 nations of Europe, could have a devastating impact on America's service economy. Internet Service Providers, telecommunications giants, and banks, brokers and even our defense contractors will lose business." This, Lightman argued, warrants greater involvement by the U.S. government. This was a hearing of the full Committee. Rep. Davis presided. He represents a northern Virginia district that is home to many internet service providers and technology companies. Rep. Henry Waxman (D-CA), the ranking Democrat, Rep. Gil Gutnecht (R-MN), Rep. Charles Dent (R-PA), and Rep. Brian Higgins (D-NY) also participated. The hearing was held in the Committee large hearing room. The room was full. 6/29. The Consumers Union (CU) and Consumer Federation of America (CFA), Washington DC based interest groups, released a report [11 pages in PDF] titled "Estimating the Consumer Costs of the Federally Mandated Digital TV Transition". This report states that, based on a survey of 1,007 U.S. households conducted on June 10-13, 2005, there are over 80 Million over the air TV sets, and that 15% of U.S. households have only over the air TV. The CU/CFA stated in a release that "Congress is considering legislation to require a firm deadline for the transition to digital-only television broadcasting which will eliminate analog signals that most televisions sets are designed to receive. Unless those sets are connected to cable or satellite services, they will stop receiving broadcasts after the final transition. Congress is also debating whether and how much to compensate consumers who must buy converter boxes to prevent their televisions from going dark." The CU/CFA report also compares its survey results to other recent survey results. The Consumer Electronics Association (CEA), a Washington DC based trade group that has also conducted a survey, responded that the CU/CFA report is methodologically flawed. 6/29. The U.S. Court of Appeals (FedCir) issued its opinion [35 pages in PDF] in Seachange v. C-COR, a patent infringement case involving video server technology. Seachange International and C-COR, which was previously named nCUBE, compete in the digital video server market. Seachange is the assignee of U.S. Patent No. 5,862,312, titled "Loosely coupled mass storage computer cluster". The abstract states that this patent discloses "A method and apparatus redundantly store data, in particular video data objects, in a distributed computer system having at least three processor systems, each processor system being connected in point to point two way channel interconnection with each other processor system. The data is stored in a redundant fashion both at the computer system level as well as the processor system level. Accordingly, the failure of a single processor does not adversely affect the integrity of the data. The computer system can also overlay a switching system connected in a ring fashion for providing a fault tolerance to the failure of a single connected processor system at the switch level. Accordingly, there results a fault tolerant data distribution system." Seachange filed a complaint in U.S. District Court (DDel) against nCUBE alleging infringement of its patent. The District Court granted summary judgment to Seachange. The Court of Appeals affirmed in part, reversed in part, vacated in part, and remanded. The Court of Appeals wrote that "Because the district court erred in interpreting ``network for data communications´´ and C-COR does not infringe as a matter of law, we reverse the judgment of infringement. Because we have construed the "network´´ limitation to be limited to point-to-point interconnections, we affirm the denial of C-COR’s motion for JMOL on inadequate written description. Because the district court correctly denied C-COR’s motion for JMOL on anticipation as to the Frey and Mendelsohn references, we affirm that ruling. For the reasons stated in this opinion, we vacate the denial of the JMOL motion as to anticipation by Gardner and remand the same to the district court for reconsideration. Because the district court erred in its interpretation of "distributed computer system" and because C-COR was prejudiced by the court’s failure to properly instruct the jury on the construction of the "distributed computer system" limitation, we reverse the district court’s denial of C-COR’s motion in the alternative for new trial and remand for further proceedings consistent with this opinion." C-COR stated in a release that "The Federal Circuit Court decided as a matter of law that C-COR did not infringe SeaChange's patent. The District Court must now decide whether SeaChange's patent was ever valid in the first place." This case is Seachange International, Inc. v. C-COR Inc., U.S. Court of Appeals for the Federal Circuit, Nos. 04-1375 and 04-1498, appeals from the U.S. District Court for the District of Delaware, D.C. No. 00-568-JJF. Judge Lynn wrote the opinion of the Court of Appeals, in which Judges Bryson and Gajarsa joined. 6/29. Federal Trade Commission (FTC) Commissioner Orson Swindle (at right) will leave the FTC. He has focused on increasing public information and awareness of cyber security issues. He has also often advocated reliance on free market solutions, and existing FTC Act authority, rather than the passage of legislation giving the FTC increased authority and responsibilities. President Bush has not yet nominated a replacement. See also, statement of FTC Chairman Deborah Majoras. 6/29. Harry Pearce was named non-executive Chairman of the Board of Nortel Networks. He has been a director since January of this year. He was previously the Chairman of the Board of Hughes Electronics Corporation. He replaces Lynton Wilson. See, Nortel release. 6/29. The Recording Industry Association of America (RIAA) announced the filing of another round of lawsuits against individuals in U.S. District Courts alleging copyright infringement in connection with their alleged copying on peer to peer systems. See, RIAA release. 6/29. Microsoft published an essay in its web site titled "Bring Spyware Out of the Shadows". It argues for Congressional legislation that would set a "national standard for anti-spyware enforcement". That is, it wants the Congress to preempt state laws in this area. 6/29. Viviane Reding, the EU Commissioner for Information Society and Media, gave a speech [4 pages in PDF] in Brussels, Belgium, titled "i2010 and Digital Convergence as an Engine of Growth and Jobs". 6/29. The Business Software Alliance (BSA) released a survey of college students on downloading copyrighted music, movie and software. See, BSA release. 6/28. Twenty-five members of the House Commerce Committee (HCC) signed a statement praising the Supreme Court's June 27 opinion [55 pages in PDF] in MGM v. Grokster. They wrote that the opinion "correctly balanced the rights of creators with the imperative to promote technological innovation under the rule of law". They continued that "As members of the House Commerce Committee, we understand that both creative products and a thriving technology sector are central to America's continued prosperity. With music, movies, computer software, books and other types of creative works comprising our second largest export, massive theft of property over the Internet jeopardizes our economic security. The Supreme Court correctly understood this and clearly stated that this case was not about technology but about those who would abuse it, turning it to illegal purposes." The HCC has fifty-seven members. In recent Congresses this Committee has asserted jurisdiction over legislation that affects intellectual property rights. That nearly half of the HCC has already praised the opinion in MGM v. Grokster suggests that it would be difficult for proponents of legislation that would overturn the effect of MGM v. Grokster to obtain Committee approval. The signers of the letter are Representatives Mary Bono (R-CA), Michael Bilirakis (R-FL), Ed Whitfield (R-KY), John Shimkus (R-IL), John Shadegg (R-AZ), Chip Pickering (R-MS), Butch Otter (R-ID), Steve Buyer (R-IN), George Radanovich (R-CA), Greg Walden (R-OR), Lee Terry (R-NE), Sue Myrick (R-NC), John Sullivan (R-OK), Marsha Blackburn (R-TN), Mike Rogers (R-MI), Henry Waxman (D-CA), Edolphus Towns (D-NY), Jan Schakowsky (D-IL), Jay Inslee (D-WA), Tammy Baldwin (D-WI), Bobby Rush (D-IL), Eliot Engel (D-NY), Mike Ross (D-AR), Mike Doyle (D-PA), and Ted Strickland (D-OH). Not included are Rep. Joe Barton (R-TX), the Chairman, Rep. John Dingell (D-MI), the ranking Democrat, or Rep. Rick Boucher (D-VA). See, story titled " Supreme Court Rules in MGM v. Grokster", and story titled "Reaction to the Supreme Court's Opinion in MGM v. Grokster", in TLJ Daily E-Mail Alert No. 1,163, June 28, 2005. 6/28. David Gross, the U.S. Coordinator for International Communications and Information Policy at the Department of State, gave a speech titled "The Other Wireless Revolution". He spoke at a Wireless Communications Association International (WCAI) in Washington DC. Gross (at right) said that "There is a an almost philosophic connection between the expansion of telecommunications and our foreign policy objectives. The thematic consistency between these two seemingly disparate arenas lies in the indivisibility of our most basic and compelling aspirations. The bedrock of telecommunications growth and good foreign policy, it seems to me, is the desire to empower individuals to exercise the freedom to which they were born and to create the conditions in which they can fulfill their potential. Freedom of choice and freedom to communicate constitute some our most cherished values and unite us in a common purpose." "The wireless information and communication technologies that you provide, however, also have contributed materially to the cause of freedom." Gross added that "democracy is strengthened by access to knowledge. And the introduction of new communications and information technologies can help shape a political eco-system where the friends of freedom are strengthened and tyranny is weakened." He said that "Mobile phones, the Internet, and satellite TV among other technologies can have a powerful impact in weakening repression, shaping how people relate to their governments, and sometime even providing the means for organizing and sustaining movements for political change." He cited as an example, that "During the recent Orange Revolution in Ukraine, opposition groups set up online forums -- using servers abroad to avoid hackers loyal to the regime -- to discuss policy and strategy." He added that "So far, governments have had difficulty stemming the tide. They have had some success licensing fax machines and blocking dissident Web sites. In Iran, for example, the government has tightened its control over the Internet. Worried about the growth of home-brewed dissent, it increasingly has tried to block reformist content in its local language, Farsi and restrict what citizens can publish through Web journals. But governments reportedly have had a particularly hard time figuring out whether and how to block text messaging." Gross also said that "Undoubtedly, despite the collective efforts of industry and the U.S. Government, there are still significant challenges to the growth of wireless and wireless broadband. One major problem recently has been attempts by some countries to craft country-specific technical standards as a form of industrial policy and protectionism. We have sought to counter this trend by encouraging greater participation in international standards bodies. Particularly in the wireless broadband area, we have sought to outline to governments the benefits of industry-driven standards processes that will result in the best solution for customers and industry alike. But, as you know, some countries have responded by trying to push their country-specific standards -- WAPI, in the case of China -- through these entities. Others, like Korea, have quietly pressured their indigenous companies to adopt home-grown cell-phone related standards like WIPI. We have encouraged these countries -- with some success -- to abandon these counter-productive efforts." Gross did not address U.S. laws, policies and proceedings that may limit the growth and use of wireless and internet technologies in the exercise of political freedom, such as excessive state and federal taxes upon communications services, the Communications Assistance for Law Enforcement Act (CALEA) and the FCC's current rulemaking proceeding regarding imposing a CALEA like regime on certain information services, the Federal Election Campaign Act (FECA) and the Federal Election Commission's (FEC) current rulemaking proceeding regarding regulating political speech on the internet, or federal encryption related policies. 6/28. Rep. Gil Gutnecht (R-MN), Rep. Bart Stupak (D-MI), and fifty-five other Representatives with rural constituents wrote a letter [PDF] to Rep. Joe Barton (R-TX) and Rep. John Dingell (D-MI), the Chairman and ranking Democrat on the House Commerce Committee (HCC), urging that any rewrite of the Communications Act include an expansion of universal service subsidies, an expansion of the universal service tax base, and an expansion of interconnection regulation. The Rural Caucus wants universal service subsidies to be expanded to include broadband DSL, cable internet access, and other services. The Rural Caucus also wants to expand the services subject to universal service taxes to all two way communications. The Rural Caucus also wants to the impose interconnection regulation upon non-telecommunications services. The letter states that "As the United States moves into the broadband age, it is imperative that we do not forget the principles that have served us so well. Let's make sure that the commitment to universal service access to communications services is protected during a rewrite so that all Americans can have access to advanced communications, such as DSL, cable, wireless, and satellite." The letter further requests that the HCC "incorporate the principles on the reverse when drafting legislation re-writing the Telecommunications Act. If incorporated, these principles will help ensure that all Americans have access to advanced broadband services at affordable rates." The letter also includes an attached list of principles. It provides that "The base of contributors to universal service must be expanded to include everyone who uses the infrastructure. This includes, but is not limited to: all providers of 2-way communications regardless of technology used ...". It also states that "The universal service fund must continue to be an industry funded mechanism and not supported through general tax revenues." And, "The fund must also not be subject to the Anti-Deficiency Act." It further states that "All providers must continue to have the obligation to allow other providers to interconnect with their networks regardless of the technology utilized". Currently, 47 U.S.C. § 251 requires, and regulates, interconnection by "telecommunications carriers". While telecommunications carriers have been subject to an interconnection mandate, and government regulation of the prices and terms of interconnection, the internet has successfully interconnected through voluntary agreements, without government mandates or regulation. The Rural Caucus proposal's use of the phrase "regardless of the technology" implies expansion of the interconnection requirement. The Rural Caucus letter also proposes that "Carriers must be compensated for all traffic utilizing their networks". The Independent Telephone and Telecommunications Alliance (ITTA), the National Telecommunications Cooperative Association (NTCA), the Organization for the Promotion and Advancement of Small Telephone Companies (OPASTCO), and the Western Telecommunications Alliance (WTA) all praised the Rural Caucus proposal. See, release. Steve Largent, P/CEO of the Cellular Telecommunications and Internet Association (CTIA), stated in a release that "Since wireless consumers are significant and disproportionate payers into the universal service and intercarrier compensation systems, the wireless industry agrees with the Rural Caucus in supporting a universal service system that collects from all segments of the communications industry. CTIA appreciates the Rural Caucus's support for rules that ensure accountability of these systems. Consumers shouldn't have to pay any more into the universal service and intercarrier compensation systems than is necessary to provide them with the high quality and affordable services they deserve. To that end, CTIA supports regulatory reforms to the universal service and intercarrier compensation systems that would encourage and reward efficiency, while ensuring that the goals of universal service are maintained. In addition, CTIA wholeheartedly agrees that the principle of competitive neutrality must be maintained in any Telecommunications Act re-write." Walter McCormick, P/CEO of the U.S. Telecom Association (USTA), wrote diplomatically in a release that "This endeavor illustrates yet another influential group acknowledging the critical need for meaningful telecom reform now." 6/28. The U.S. Court of Appeals (2ndCir) issued its opinion [PDF] in Island Software v. Microsoft, a software copyright infringement case involving the issue of the standard of proof of willfulness of infringement at the summary judgment stage. Under 17 U.S.C. § 504, willfulness is relevant in awarding damages. Island Software is a >software retailer and computer repairer located in Coram, New York. In 2000 it sold counterfeit copies of Windows 95, Windows 98, and Office 2000 Professional to a private investigator employed by Microsoft. Microsoft then sent Island Software a cease and desist letter, in which it also threatened litigation, but offered to settle for $15,000, and Island Software's identification of the supplier of the counterfeit items. Rather than settle, Island Software filed a complaint in U.S. District Court (EDNY) against Microsoft seeking a declaratory judgment of noninfringement. Microsoft filed a counterclaim in which it plead copyright infringement in violation of 17 U.S.C. § 501. Microsoft also sought enhancement of damages based upon willful infringement. Microsoft also plead trademark infringement under the Lanham Act, 15 U.S.C. § 1114 et seq., false designation of origin under the Lanham Act, 15 U.S.C. § 1125 et seq., and unfair competition under New York common law. However, these are not the subject of the present appeal. Island Software lost. The District Court on summary judgment awarded Microsoft $240,000 in statutory damages, $30,000 for each of the eight copyrighted works at issue, based upon its finding of willfulness. Island Software had submitted an affidavit in which the affiant denied actual knowledge of the counterfeiting. However, the District Court found that there was constructive knowledge and reckless disregard, based upon the prices that it paid to its distributor, its failure to inspect the products that it sold, and a prior customer complaint that he had been sold a counterfeit product. The Court of Appeals affirmed the District Court judgment as to copyright infringement, but vacated the award of damages. The Court of Appeals held that because of the affidavit, there was a genuine issue of material fact, and it was error to rule on the issue of willfulness at the summary judgment stage. The Court of Appeals wrote that "In the absence of evidence conclusively demonstrating actual, rather than constructive, knowledge of infringement, we conclude that summary judgment on the question of willfulness was inappropriate." However, the Court also added that "the evidence of willfulness, in the instant case, is strong." Microsoft may well prevail obtain its $240,000 damage award upon trial. This case is Island Software and Computer Service, Inc. and Michael Brunner v. Microsoft Corporation, U.S. Court of Appeals for the 2nd Circuit, No. 04-0744-cv. Judge Calabresi wrote the opinion of the Court of Appeals, in which Judges Kearse and Oakes joined. 6/28. President Bush nominated David McCormick to be Under Secretary of Commerce for Export Administration. That is, he has been selected to lead the Department of Commerce's (DOC) Bureau of Industry and Security (BIS). The BIS was previously named the Bureau of Export Administration (BXA). See, White House release and release. 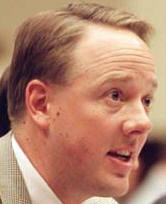 McCormick currently is the President of Ariba, Inc., a software company. He is a graduate of the U.S. Military Academy at West Point. The previous head of the BIS was Kenneth Juster. Juster is now the EVP of Legal Affairs and Corporate Development at Salesforce.com. The acting head of the BIS is Peter Lichtenbaum. The BIS regulates exports, and other activities, for national security, and other, purposes. This includes regulation of the export of dual use items, such as computers, microprocessors, software and encryption products. This BIS also regulates business practices that it identifies as "deemed exports", such as employment of foreign nationals, use of software by foreign nationals, and access to technical data by foreign nationals. The BIS has also used its regulation of exports to attempt to control domestic production and sales. In addition, President Bush nominated Darryl Jackson to be the Assistant Secretary of Commerce (Export Enforcement). Jackson is a partner in the Washington DC office of the law firm of Arnold & Porter. His firm biography states that he handles civil litigation and white collar criminal defense. However, it makes no reference to export enforcement. The previous Assistant Secretary for Export Enforcement was Julie Myers. The acting Assistant Secretary is Wendy Wysong. 6/28. President Bush nominated Josette Shiner to be Under Secretary of State (Economic, Business and Agricultural Affairs). She is currently Deputy U.S. Trade Representative. She was previously P/CEO of Empower America, and before that, Managing Editor of The Washington Times. See, White House release and release. 6/28. The House Judiciary Committee's (HJC) Subcommittee on Courts, the Internet and Intellectual Property (CIIP), approved by voice vote HR 2791, the "Patent and Trademark Fee Modernization Act of 2005". This bill is almost identical to a bill that the House, but not the Senate, approved last year. It contains increases in user fees that implement the U.S. Patent and Trademark Office's (USPTO) 21st Century Strategic Plan. It provides for U.S. outsourcing of patent searches. It also provides for an end to the diversion of user fees to subsidize other government programs. See also, story titled "CIIP Subcommittee to Mark Up USPTO Fee Bill" in TLJ Daily E-Mail Alert No. 1,162, June 27, 2005. 6/28. The House Judiciary Committee's (HJC) Subcommittee on Courts, the Internet and Intellectual Property (CIIP), approved by voice vote HR 2955, the "Intellectual Property Jurisdiction Clarification Act of 2005". This bill is a legislative response to the opinion of the Supreme Court in Holmes Group, Inc. v. Vornado Air Circulation Systems, Inc., 535 U.S. 826 (2002). See, story titled "Supreme Court Rules on Appellate Jurisdiction of Federal Circuit" in TLJ Daily E-Mail Alert No. 443, June 4, 2002. Basically, in the Holmes case the Supreme Court held that the Federal Circuit's appellate jurisdiction cannot be based solely upon a patent counterclaim. This bill, for example, would amend 28 U.S.C. § 1338 to clarify that when a complaint is filed in state court that does not plead a cause of action under patent or copyright law, and then a counterclaim is plead under patent or copyright law, there is no jurisdiction in the state court over the patent or copyright claim. See also, story titled "CIIP Subcommittee to Mark Up Intellectual Property Jurisdiction Clarification Act" in TLJ Daily E-Mail Alert No. 1,162, June 27, 2005. 6/28. Microsoft stated in a release that "it has signed a Technical Cooperation Agreement with the High-Tech Crime Technology Division, Info-Communications Bureau of the National Police Agency (NPA) of Japan. Under this agreement, Microsoft will help support the division's cybercrime-fighting efforts by providing security training and a hot line for sharing technical information." 6/28. The Federal Communications Commission (FCC) adopted, and released, an order [pages in PDF] in its proceeding titled "In the Matter of Telecommunications Relay Services and Speech-to-Speech Services for Individuals with Hearing and Speech Disabilities". The order states that it "adopts interstate TRS compensation rates for the July 1, 2005 through June 30, 2006 TRS Fund year. We adopt separate compensation rates for traditional TRS and Internet Protocol (IP) Relay. We adopt per-minute compensation rates as follows for this fund year: for Speech-to-Speech Service (STS), $1.579; for traditional TRS, $1.440; for IP Relay, $1.278; and for Video Relay Service (VRS), $6.644." (Footnotes omitted.) This item is FCC 05-135 in CC Docket No. 98-67 and CG Docket No. 03-123. 6/28. The U.S. Court of Appeals (DCCir) issued its divided opinion [32 pages PDF] in APCC Services v. Sprint. The Court of Appeals held that Chapter 5 of the Communications Act, which is codified at 47 U.S.C. §§ 151–615b, does not create a private right of action for an owner or operator of a payphone to recover from an interexchange carrier (IXC) the compensation for coinless payphone calls required by a Federal Communications Commission (FCC) rules. This case is APCC Services, Inc. v. Sprint Communications Co., No. 04-7034, appeals from the U.S. District Court (DC), D.C. Nos. 01cv00642 and 99cv00696. 6/28. Peter Mandelson, the EU Commissioner for Trade, gave a speech titled "The Progressive Case for Open Markets". He advocated free trade, and opposed protectionist policies. He also stated that "At the same time we need to focus European spending programmes on the creation of European centres of research excellence and building technology platforms that link in with European companies, and help counter the transatlantic brain drain Europe is suffering." He spoke in New York City to the Council on Foreign Relations. 6/27. The Supreme Court issued its unanimous opinion [55 pages in PDF] in MGM v. Grokster, reversing the judgment of the U.S. Court of Appeals (9thCir) regarding vicarious copyright infringement by the distributors of peer to peer (P2P) systems. The Supreme Court held that "one who distributes a device with the object of promoting its use to infringe copyright, as shown by clear expression or other affirmative steps taken to foster infringement, is liable for the resulting acts of infringement by third parties." 6/27. Numerous persons reacted to the Supreme Court's opinion [55 pages in PDF] in MGM v. Grokster, reversing the judgment of the U.S. Court of Appeals (9thCir) regarding copyright infringement and the distributors of peer to peer (P2P) systems. The Department of Justice's (DOJ) Office of the Solicitor General previously filed a brief urging the Supreme Court to reverse the 9th Circuit. Following release of the opinion, Attorney General Alberto Gonzales stated in a release that "I am pleased that the Supreme Court has considered this important case and determined that those who intentionally induce or encourage the theft of copyrighted music, movies, software, or other protected works may be held liable for their actions. As the Solicitor General argued in this case, the Ninth Circuit Court of Appeals had created a standard that was unduly narrow and prevented victims from bringing civil court cases even on the assumption that companies have actively induced others to violate federal copyright laws on a massive scale. The Department of Justice remains strongly committed to the enforcement of intellectual property rights, and we will continue to support the ability of victims of intellectual property theft to pursue remedies for infringement in the civil courts." Congressional Reaction. Rep. Lamar Smith (R-TX), the Chairman of the House Judiciary Committee's (HJC) Subcommittee on Courts, the Internet and Intellectual Property (CIIP), stated in a release that "This is a huge victory for America’s creators. I am pleased that the Supreme Court recognizes the need to protect American innovation". He continued that "Piracy and intellectual property theft cost American businesses billions of dollars and hundreds of thousands of jobs each year. A problem exists when the vast majority of people who would never shoplift a CD at a record store think nothing of downloading entire albums from peer-to-peer networks without paying for them ... Both shoplifting and illegally downloading copyrighted materials are wrong and represent a direct threat to artists, software developers, and others whose livelihoods depend on their creations". Rep. Smith added that "In the weeks to come, the Intellectual Property Subcommittee will analyze the Court’s decision and its implications". No hearings have yet been scheduled. Also, the Supreme Court's opinion likely means that Rep. Smith, and other Congressional supporters of the content industries, will not now introduce legislation to protect the content industries from those who induce infringement. However, those who disagree with the Supreme Court's holding may introduce their own legislation. Rep. Zoe Lofgren (D-CA), another member of the CIIP Subcommittee, stated in a release that "Today's Grokster decision was a victory for copyright holders, but it was also a victory for the future of technology. The Supreme Court wisely zeroed in on conduct, not technology, by refusing to alter the Sony Betamax standard. I hope that this decision provides the clarity legitimate innovators need to develop new and exciting technologies without the incessant threat of copyright litigation." Sen. Ted Stevens (R-AK) and Sen. Daniel Inouye (D-HI) issued a joint statement. They wrote that "we also look forward to reviewing the Court’s decision in Grokster, and to considering its impact on efforts to stem the tide of digital piracy while promoting e-commerce and the Internet's lawful uses." They are the Chairman and ranking Democrat on the Senate Commerce Committee (SCC). The Senate Judiciary Committee (SJC) has jurisdiction over intellectual property bills. Sen. Orrin Hatch (R-UT), the Chairman of the SJC's Subcommittee on Intellectual Property, offered slight praise for the Supreme Court. He wrote in a release that "Authors, artists and producers can breathe a little easier today knowing their works are a little safer." Sen. Hatch added that "Prudence and respect for the role of the courts suggest Congress wait until it becomes clear how today’s decision will play out in the lower courts before there is a rush to legislate. Obviously, if it appears that U.S. industries, technological innovation, or consumers are ultimately harmed by this decision, Congress should consider a legislative solution that appropriately balances consumer interests, innovation, and intellectual property rights." Sen. Patrick Leahy (D-VT), the ranking Democrat on the SJC, stated in a release that "This decision means that companies can no longer, with a wink and a nod, absolve themselves from any responsibility for what their products do. Just as consumers bear a responsibility for using these products to illegally download files, the companies that fashion and promote these tools must share in that obligation." Industry Reaction. Mitch Bainwol, Ch/CEO of the Recording Industry Association of America (RIAA), stated in a release that "With this unanimous decision, the Supreme Court has addressed a significant threat to the U.S. economy and moved to protect the livelihoods of the more than 11 million Americans employed by the copyright industries. The Supreme Court has helped to power the digital future for legitimate online businesses -- including legal file sharing networks -- by holding accountable those who promote and profit from theft. This decision lays the groundwork for the dawn of a new day -- an opportunity that will bring the entertainment and technology communities even closer together, with music fans reaping the rewards." Dan Glickman, P/CEO of the Motion Picture Association of America (MPAA), stated in a release [MS Word] that "Today’s unanimous ruling is an historic victory for intellectual property in the digital age, and is good news for consumers, artists, innovation and lawful Internet businesses. The Supreme Court sent a strong and clear message that businesses based on theft should not and will not be allowed to flourish. This decision will be of utmost importance as we continue developing innovative and legitimate ways to marry content and technology so consumers can access entertainment on a variety of devices." In contrast, Gary Shapiro, P/CEO of the Consumer Electronics Association (CEA), stated in a release that "The immediate impact of today's ruling is twofold: massive uncertainty and the likelihood of massive legal bills. The Court has done little to provide a clear path for legitimate innovators and manufacturers to avoid lawsuits related to copyright infringement over legitimate products and services." Shapiro continued that "With this ruling the Supreme Court has handed a powerful new tool to litigious content creators to stop innovation. Innovators must now consider new murky legal rules and potentially overwhelming legal costs before bringing their product to market - or even moving forward with an innovative idea. It is essentially a 'full employment act' for plaintiff's attorneys and a guarantee for further lawsuits." He added that "While the Court appears to have sought to narrowly tailor this decision to protect technological development and provide some guidance to promote innovation, the intent test established under this ruling stands as a heavy burden. Content creators may potentially find any act as an 'infringement to induce' and shut down a new product or service with the threat of a lawsuit. Who knows how many innovative products and services now face a premature death as the result of this ruling?" More Reaction. Jim DeLong of the Progress & Freedom Foundation (PFF) stated in a release that "This looks like a giant win for everyone. For the tech industry -- the Court made clear that Sony is still good law, and that simply marketing a product with the knowledge that some people will use it to infringe is not a basis for liability. For the content providers -- the Court said that intentional inducement of infringement is illegal, and that in proving the existence of the intent the copyright holders can point to the infringement-dependent business models of Grokster and its kin, and to their failure to take any affirmative steps (such as filtering) to prevent infringement. And for consumers -- the unanimity shows that the Court meant what it said about the crucial importance of intellectual property rights when it decided Eldred two years ago, which is crucial to the cornucopia of creativity that the Internet makes possible." Gigi Sohn, President of Public Knowledge, stated in a release that "Today's Court decision in the Grokster case underscores a principle Public Knowledge has long promoted -- punish infringers, not technology. The Court has sent the case back to the trial court so that the trial process can determine whether the defendant companies intentionally encouraged infringement. What this means is, to the extent that providers of P2P technology do not intentionally encourage infringement, they are exempt from secondary liability under our copyright law. The Court also acknowledged, importantly, that there are lawful uses for peer-to-peer technology, including distribution of electronic files `by universities, government agencies, corporations, and libraries, among others.´"
Jerry Berman of the Center for Democracy and Technology (CDT) stated in a release that "The court has worked to craft careful balance that allows copyright owners to pursue bad actors, but still protect the rights of technology makers. We hope this decision will preserve the climate of innovation that fostered the development of everything from the iPod to the Internet itself." 6/27. The Supreme Court issued its opinion [59 pages in PDF] in NCTA v. Brand X, upholding the Federal Communications Commission's (FCC) determination that cable broadband internet access service is an information service, and reversing the judgment of the U.S. Court of Appeals (9thCir). The Supreme Court overturned the 2003 opinion [39 pages in PDF] of the 9th Circuit, which vacated the FCC's 2002 Declaratory Ruling (DR) that cable modem service is an information service, and that there is no separate offering as a telecommunications service. The 9th Circuit vacated the FCC's DR, in part, because it determined that as a result of a procedural oddity, it need not apply Chevron deference. The Supreme Court held that Chevron deference applies in this matter, and that under this standard of review, the FCC's DR is a lawful construction of the Communications Act. This is a victory, after an long and hard fought battle, for the broadband policy of former FCC Chairman Michael Powell. FCC Reaction. Federal Communications Commission (FCC) Chairman Kevin Martin stated in a release [PDF] that "I am pleased that the U.S. Supreme Court has affirmed the FCC’s ruling. This decision provides much-needed regulatory clarity and a framework for broadband that can be applied to all providers. We can now move forward quickly to finalize regulations that will spur the deployment of broadband services for all Americans." FCC Commission Kathleen Abernathy stated in a release [PDF] that "I am gratified that the Supreme Court has deferred to the Commission’s finding that cable modem services are “information services.” As I stated when the ruling upheld today was adopted, this classification accords the Commission the flexibility it needs to craft a minimal regulatory environment that promotes investment and innovation in a competitive marketplace. Now that the Court has resolved lingering uncertainty regarding the regulatory treatment of cable-based Internet access services, I am hopeful that the Commission will act quickly to establish a similarly forward-looking approach for competitive wireline xDSL services." FCC Commission Michael Copps stated in a release [PDF] that "We really have our work cut out for us now. In the wake of this decision, the FCC confronts the challenge of protecting consumers, maintaining universal service and ensuring public safety in uncertain legal terrain. Today’s decision makes the climb much steeper. But this country just has to find ways to promote innovation, enhance competition, protect the openness of the Internet, and return the United States to a position of leadership in broadband penetration. The Commission needs to think anew and act anew to meet these challenges, and I look forward to working with my colleagues to do just that." FCC Commission Jonathan Adelstein stated in a release [PDF] that "Speeding the wide deployment of broadband services throughout this country is one of the top priorities for the Commission. The Court's decision should not mean that policymakers turn their backs on American consumers or neglect public safety. I look forward to working with my colleagues at the FCC and with Congress to both promote a truly competitive marketplace and to ensure that all consumers are protected and have access to affordable broadband services." Congressional Reaction. Rep. Joe Barton (R-TX), the Chairman of the House Commerce Committee, stated in a release that "I commend the court for upholding the FCC's deregulatory approach to broadband services. The FCC correctly determined that broadband services should not be regulated as common carriage. After an erroneous ruling by the Ninth Circuit, the court affirmed the validity of the FCC's determination." Rep. Barton added that "While I am pleased that the court has removed the clouds of uncertainty regarding the proper regulatory framework for broadband services, this decision and the uncertainty that has existed in the market since the Ninth Circuit's erroneous decision demonstrate why Congress needs to modernize the Communications Act. Congress needs to remove the ambiguity regarding what broadband services are and how they should be regulated. I look forward to working with subcommittee Chairman Upton and the rest of my colleagues to bring clarity and consistency to the statutory framework governing the regulation of broadband and Internet Protocol services." Sen. Ted Stevens (R-AK) and Sen. Daniel Inouye (D-HI) issued a joint statement. They wrote that "We are carefully reviewing the Brand X decision reached by the Supreme Court today. Brand X involves the legal treatment of cable modem services, and the decision announced today will have a number of complex policy implications for the communications industry and consumers." They added that "we will review the decision’s impact on existing public interest obligations, including its effect on the Universal Service Fund, the provision of 911 services, access for persons with disabilities, consumer privacy protections, and on law enforcement and anti-terrorism activities. We will also be reviewing how this decision affects Internet Service Providers (ISPs), interconnection issues, as well as its implication on the proper regulatory treatment for DSL services. All of these issues deserve careful consideration, and we look forward to examining the Brand X decision in the context of our review of current communications laws. Such action will permit us to consider what steps may be necessary from the Congress or the Federal Communications Commission to ensure that our communications laws preserve competition and protect the interests of consumers." More Reaction. Kyle Dixon stated in a release that "This is a hands-down victory for consumers, maximizing incentives to build competing broadband networks. The Court sent a strong message to the market: `Compete, don't look for government hand-outs.´"
Dixon is Director of the Progress and Freedom Foundation's (PFF) Federal Institute for Regulatory Law & Economics. He was previously an advisor to former FCC Chairman Michael Powell. The PFF will host a panel discussion on the Supreme Court's opinion at 12:00 NOON on Friday, July 15. See, notice. Kyle McSlarrow, P/CEO of the National Cable and Telecommunications Association (NCTA), stated in a release that "Today's Supreme Court's decision is a victory for consumers and maintains the momentum to advance broadband in the U.S. Classifying cable modem service as an interstate information service, as the FCC did, keeps this innovative service on the right deregulatory path." Walter McCormick, P/CEO of U.S. Telecom Association (USTA), stated in a release that "Today's Supreme Court decision clarifies the Commission’s role in setting a framework for service providers in the rapidly changing communications market. While this was the correct decision for the cable industry, it further highlights why all providers must be given the same incentive to invest and deploy new technologies." In contrast, Dave Baker, VP of Earthlink, which challenged the FCC's order, stated in a release that "Today's Supreme Court ruling is a blow to consumers and competition. For too long, cable companies and the FCC have denied consumers a choice of broadband providers over cable. Besides keeping prices high, this lack of choice limits the future deployment of innovative voice, video and data services beyond just those offered by the local cable company." "We will also work with Congress as it revisits the Telecommunications Act in order to ensure customer choice and the future deployment of advanced communications services and applications." 6/27. The Supreme Court granted certiorari in Texaco v. Dagher and Shell v. Dagher. See, Order List [11 pages in PDF] at page 3. The Supreme Court also wrote that "The motion of Washington Legal Foundation for leave to file a brief as amicus curiae is granted. The motion of Visa U.S.A. Inc., et al. for leave to file a brief as amici curiae is granted. The motion of Chamber of Commerce of the United States, et al. for leave to file a brief as amici curiae is granted. The motion of Antitrust Scholars for leave to file a brief as amici curiae is granted. The petitions for writs of certiorari are granted. The cases are consolidated and a total of one hour is allotted for oral argument." Department of Justice's (DOJ) Office of the Solicitor General wrote in a brief that the issue is "Whether an agreement between the owners of a lawful joint venture with respect to the pricing of the joint venture's products may be treated as a per se violation of Section 1 of the Sherman Act, 15 U.S.C. 1, when the joint venture's owners do not compete in the market for those products." This case is Texaco, Inc. v. Fouad N. Dagher, et al., No. 04-805, and Shell Oil Company v. Fouad N. Dagher, et al., No. 04-814, petitions for writ of certiorari to the U.S. Court of Appeals for the 9th Circuit. 6/27. Rep. James Sensenbrenner (R-WI) introduced HR 2791, the "Patent and Trademark Fee Modernization Act of 2005", on June 8, 2005. This bill contains increases in user fees that implement the U.S. Patent and Trademark Office's (USPTO) 21st Century Strategic Plan. It provides for U.S. outsourcing of patent searches. It also provides for an end to the diversion of user fees to subsidize other government programs. The House Judiciary Committee's (HJC) Subcommittee on Courts, the Internet and Intellectual Property (CIIP) is scheduled to mark up HR 2791 at 10:00 AM on Tuesday, June 28. HR 2791 (109th Congress) is very similar to HR 1561 (108th Congress), the "United States Patent and Trademark Fee Modernization Act of 2004". The House approved HR 1561 by a vote of 379-28, on March 3, 2004. See, Roll Call No. 38. See, story titled "House Passes USPTO Fee Bill" in TLJ Daily E-Mail Alert No. 849, March 4, 2004. The Senate Judiciary Committee amended and reported the bill. However, the full Senate did not approve the bill. Late last year the Congress enacted HR 4818 (108th), a huge omnibus appropriations bill that included funding for the USPTO. It included the fee increases of HR 1561, but only for FY 2005 and 2006. The appropriations bill also contained HR 1561's language regarding outsourcing patent searches to U.S. companies. However, it did not include HR 1561's language regarding ending fee diversion. See, story titled "Appropriations Bill Provides $1.54 Billion for USPTO, Temporary Fee Increases, But No End to Diversion" in TLJ Daily E-Mail Alert No. 1,023, November 22, 2004. HR 2791 includes the fee diversion language. It provides as follows: "There is established in the Treasury a Patent and Trademark Fee Reserve Fund. If fee collections by the Patent and Trademark Office for a fiscal year exceed the amount appropriated to the Office for that fiscal year, fees collected in excess of the appropriated amount shall be deposited in the Patent and Trademark Fee Reserve Fund. After the end of each fiscal year, the Director shall make a finding as to whether the fees collected for that fiscal year exceed the amount appropriated to the Patent and Trademark Office for that fiscal year. If the amount collected exceeds the amount appropriated, the Director shall, if the Director determines that there are sufficient funds in the Reserve Fund, make payments from the Reserve Fund to persons who paid patent or trademark fees during that fiscal year. The Director shall by regulation determine which persons receive such payments and the amount of such payments, except that such payments in the aggregate shall equal the amount of funds deposited in the Reserve Fund during that fiscal year, less the cost of administering the provisions of this paragraph." HR 2791 makes several changes to HR 1561. First, it changes the title of the bill by replacing 2004 with 2005. Second, HR 2791 adds the following clause: "Title VIII of division B of the Consolidated Appropriations Act, 2005 (35 U.S.C. 41 note; Public Law 108-447; 118 Stat. 2924) is repealed." That is, the omnibus appropriations bill, HR 4818 (108th), became Public Law No. 108-447. Division B, Title VII, pertains to USPTO fees. Hence, this clause deletes the temporary two year implementation of the increases in fees. The bill makes them permanent. Third, HR 2791 deletes the following clause from HR 1561: "EXISTING APPROPRIATIONS---The provisions of any appropriation Act that make amounts available pursuant to section 42(c) of title 35, United States Code, and are in effect on the effective date set forth in subsection (a) shall cease to be effective on that effective date." 6/27. Rep. Lamar Smith (R-TX) introduced HR 2955, the "Intellectual Property Jurisdiction Clarification Act of 2005", on June 16, 2005. The House Judiciary Committee's (HJC) Subcommittee on Courts, the Internet and Intellectual Property (CIIP) is scheduled to mark up HR 2955 at 10:00 AM on Tuesday, June 28. Summary of HR 2955. First, HR 2955 would amend 28 U.S.C. § 1338, regarding "Patents, plant variety protection, copyrights, mask works, designs, trademarks, and unfair competition". The section provides for jurisdiction in the U.S. District Courts. Currently, 28 U.S.C. § 1338(a) provides that "The district courts shall have original jurisdiction of any civil action arising under any Act of Congress relating to patents, plant variety protection, copyrights and trademarks. Such jurisdiction shall be exclusive of the courts of the states in patent, plant variety protection and copyright cases." HR 2955 provides that "Section 1338(a) of title 28, United States Code, is amended by striking the second sentence and inserting the following: `No State court shall have jurisdiction over any claim for relief arising under any Act of Congress relating to patents, plant variety protection, or copyrights.´"
Second, HR 2955 would amend 28 U.S.C. § 1295, regarding "Jurisdiction of the United States Court of Appeals for the Federal Circuit". Currently, 28 U.S.C. § 1295(a)(1) provides that "(a) The United States Court of Appeals for the Federal Circuit shall have exclusive jurisdiction -- (1) of an appeal from a final decision of a district court of the United States ... if the jurisdiction of that court was based, in whole or in part, on section 1338 of this title, except that a case involving a claim arising under any Act of Congress relating to copyrights, exclusive rights in mask works, or trademarks and no other claims under section 1338 (a) shall be governed by sections 1291, 1292, and 1294 of this title; ". HR 2955 provides that "Section 1295(a)(1) of title 28, United States Code, is amended to read as follows: `(1) of an appeal from a final decision of a district court of the United States ... in any civil action in which a party has asserted a claim for relief arising under any Act of Congress relating to patents or plant variety protection;´"
Third, HR 2955 would add a new Section 1454 to Title 28 regarding removal of cases to the U.S. District Court. It provides, in part, that "A civil action in which any party asserts a claim for relief arising under any Act of Congress relating to patents, plant variety protection, or copyrights may be removed to the district court of the United States for the district and division embracing the place where such action is pending". Holmes Group v. Vornado. These are subtle, but significant changes, in federal jurisdiction in intellectual property cases. The change to § 1338 clarifies that when a complaint is filed in state court that does not plead a cause of action under patent or copyright law, and then a counterclaim is plead under patent or copyright law, there is no jurisdiction in the state court over the patent or copyright claim. The amendments maintains federal court control over intellectual property cases and law. Under the current statutes, as interpreted by the courts, there is uncertainty on the question of state jurisdiction over intellectual property counterclaims. The uncertainty arises, in part, as a result of the Supreme Court's opinion in Holmes Group, Inc. v. Vornado Air Circulation Systems, Inc., 535 U.S. 826 (2002). See, story titled "Supreme Court Rules on Appellate Jurisdiction of Federal Circuit" in TLJ Daily E-Mail Alert No. 443, June 4, 2002. Basically, in the Holmes case the Supreme Court held that the Federal Circuit's appellate jurisdiction cannot be based solely upon a patent counterclaim. Critics of the Holmes opinion have variously argued that it reduces will federal control over IP cases, reduce uniformity of patent law, and encourage forum shopping. See also, article by Christopher Cotropia titled "`Arising Under´ Jurisdiction and Uniformity in Patent Law" in the Michigan Telecommunications and Technology Law Review. In contrast, see article [33 pages in PDF] by Ravi Sitwala titled "In Defense of Holmes v. Vornado: Addressing the Unwarranted Criticism" in the NYU Law Review. CIIP Subcommittee Hearing. The CIIP Subcommittee held an oversight hearing on this topic on March 17, 2005. Sanjay Prasad, Chief Patent Counsel of Oracle, wrote in his prepared testimony that Holmes "calls into question the unification of patent law provided by the Court of Appeals for the Federal Circuit. Subsequent decisions by state courts in response to Holmes Group also call into question the exclusive jurisdiction of federal district courts over patent and copyright cases. Redistributing patent jurisdiction away from the Federal Circuit and patent and copyright law away from the federal courts will materially impact the uniformity of these important laws. The result will be greater uncertainty, unpredictability and cost in the resolution of intellectual property disputes." Edward Reines of Weil Gotshal & Manges testified on behalf of the Federal Circuit Bar Association. He wrote in his prepared testimony [PDF] that in Holmes "the Supreme Court limited the appellate jurisdiction of the Federal Circuit to cases in which the patent infringement claim is first asserted in the complaint. Thus, a case in which the patent claim first appears in the counterclaim is no longer appealed to the Federal Circuit. Justice Scalia based the Court’s ruling, not on the Congressional intent behind the relevant statutes, and not on any policy justification, but on a very literalistic parsing of the involved statutes." He continued that "Holmes Group creates two distinct problems. First, regional circuits have now begun hearing patent infringement disputes, albeit on an irregular basis, after 20+ years of not having decided patent cases at all. Which appeals court hears a particular patent appeal now depends on which particular pleading happens to contain the patent claim. Second, based on Holmes Group, state courts now are exercising jurisdiction over patent and copyright claims, even though such claims have been treated as within the exclusive jurisdiction of the federal courts for decades if not centuries. See also, opening statement of Rep. Smith, prepared testimony [PDF] of Arthur Hellman (University of Pittsburgh School of Law) and prepared testimony [PDF] of Meredith Addy. In addition, on March 14, 2005, Michael Kirk, Executive Director of the American Intellectual Property Law Association (AIPLA), wrote a letter [3 pages in PDF] to the CIIP Subcommittee requesting remedial legislation. He wrote that "AIPLA believes that the Holmes case has the potential to undermine the mandate of the Federal Circuit to bring uniformity to the patent law and that a legislative adjustment is needed to prevent this from occurring." 6/27. Advanced Micro Devices (AMD) filed a complaint [PDF] in U.S. District Court (DDel) against Intel alleging violation of Section 2 of the Sherman Antitrust Act, Sections 4 and 16 of the Clayton Act, and the California Business and Professions Code. Hector Ruiz, Ch/P/CEO of AMD, stated in a release that "Everywhere in the world, customers deserve freedom of choice and the benefits of innovation -- and these are being stolen away in the microprocessor market ... Whether through higher prices from monopoly profits, fewer choices in the marketplace or barriers to innovation -- people from Osaka to Frankfurt to Chicago pay the price in cash every day for Intel’s monopoly abuses." See also, open letter from Ruiz. Paul Otellini, P/CEO of Intel, stated in a release that "Intel has always respected the laws of the countries in which we operate ... We compete aggressively and fairly to deliver the best value to consumers. This will not change. Over the years, Intel has been involved in other antitrust suits and faced similar issues. Every one of those matters has been resolved to our satisfaction. We unequivocally disagree with AMD’s claims and firmly believe this latest suit will be resolved favorably, like the others." The complaint alleges that Intel forced major customers to accept exclusive deals, withheld rebates and marketing subsidies as a means of punishing customers who buy more than prescribed quantities of processors from AMD, threatened retaliation against customers doing business with AMD, establishing quotas keeping retailers from selling the computers they want, and forced PC makers to boycott AMD product launches. The prayer for relief requests that the Court "Find that Intel is wrongfully maintaining its monopoly in the x86 Microprocessor Market in violation of Section 2 of the Sherman Act and award AMD treble damages in an amount to be proven at trial, pursuant to Section 4 of the Clayton Act, 15 U.S.C. § 15(a)". The complaint further requests that the Court "Find that Intel has made secret payments and allowances of rebates and discounts, and secretly and discriminatorily extended to certain purchasers special services or privileges, all in violation of California Business & Professions Code § 17045, and pursuant thereto award AMD treble damages for its resulting lost profits in an amount to be proven at trial". The complaint further requests that the Court "Find that Intel has intentionally interfered with valuable business relationships of AMD to its economic detriment and award AMD damages in an amount to be proven at trial for its resulting losses, as well as punitive damages, as permitted by law". The complaint further requests that the Court "Grant injunctive relief prohibiting Intel and all persons, firms and corporations acting on its behalf or under its direction or control from engaging in any further conduct unlawful under Section 2 of the Sherman Act or Section 17045 of the California Business and Professions Code". The complaint further requests that the Court "Award AMD such other, further and different relief as may be necessary or appropriate to restore and maintain competitive conditions in the x86 Microprocessor Market"
Japan Fair Trade Commission. Thomas McCoy, EVP Legal Affairs for AMD, stated that "You don't have to take our word for it when it comes to Intel’s abuses; the Japanese government condemned Intel for its exclusionary and illegal misconduct ... We encourage regulators around the world to take a close look at the market failure and consumer harm Intel's business practices are causing in their nations. Intel maintains illegal monopoly profits at the expense of consumers and computer manufacturers, whose margins are razor thin. Now is the time for consumers and the industry worldwide to break free from the abusive Intel monopoly." This is a reference to the recommendation of the Japan Fair Trade Commission (JFTC) regarding Intel's Japanese subsidiary, Intel Kabushiki Kaisha (IJKK), earlier this year. The JFTC wrote in a March 8 English language release that it "requires IJKK to cease and desist its conducts which violate Section 3 of the Antimonopoly Act". On March 31, 2005 Intel announced that it accepts the March 8 recommendation of the JFTC. See also, story titled "Intel Accepts Recommendation of Japanese FTC Regarding Anticompetitive Marketing Practices" in TLJ Daily E-Mail Alert No. 1,107, April 1, 2005. AMD's attorney of record is the Delaware law firm of Richards Layton & Finger. This case is Advanced Micro Devices, Inc. and AMD International Sales & Service, Ltd. v. Intel Corporation and Intel Kabushiki Kaisha, U.S. District Court for the District of Delaware, D.C. No. 05-441. 6/27. The Appellate Body of the World Trade Organization (WTO) issued its report [101 pages in PDF] titled "United States -- Countervailing Duty Investigation on Dynamic Random Access Memory Semiconductors (DRAMS) from Korea". This report overturns key parts of the Dispute Settlement Body's (DSB) February 21, 2005 report. Micron Technology, a company based in the state of Idaho that makes semiconductors, including DRAMs, has long complained to U.S. executive branch agencies, including the Department of Commerce (DOC) and the U.S. International Trade Commission (USITC), and to the Congress, regarding DRAM related subsidies made by the Korean government. The U.S. imposed countervailing duties on DRAM semiconductors made in Korea. Korea then complained to the WTO. On February 21, 2005, a DSB of the WTO issued a report [121 pages in PDF]. It concluded that the U.S. countervailing duties are in violation of the Agreement on Subsidies and Countervailing Measures (SCM). The U.S. appealed. And now, the Appellate Body has reversed the DSB's findings that U.S. countervailing duties violate Sections 1 and 2 of the SCM. U.S. Trade Representative Robert Portman stated in a release that "This is an important turnaround for U.S. high-tech manufacturers, as well as the international trading system ... The international trading system is built on fairness, and the Korean government unfairly subsidized a Korean company. The Appellate Body report will help to ensure that governments play by the rules. Governments shouldn't be able to give unfair subsidies by pressuring banks to provide non-commercial loans. This is another example of how the Administration, day-in and day-out, is working aggressively to use U.S. trade laws to level the playing field and, when needed, to defend our actions at the WTO. We believe today's decision will strengthen the ability of U.S. companies to compete against Korean firms on an equal footing in Korea and around the world". The USTR release offers this summary of the Appellate Body report. "The Appellate Body agreed with the United States that the WTO panel committed multiple errors in reviewing the U.S. determination that the Government of Korea subsidized Hynix by pressuring private creditors to provide financial assistance to the company. These panel errors included a failure to examine the record evidence in its totality; a refusal to consider evidence that was on the record of the underlying investigation and that was cited by the United States; and a key finding by the panel that was not supported by evidence on the record of the underlying investigation. Cumulatively, these errors amounted to a failure on the part of the panel to apply the correct standard of review. According to the Appellate Body, "the Panel essentially ‘second-guessed’ the investigating authority’s analysis of the evidence and thus overstepped the bounds of its review." See also, Micron release praising the Appellate Body report, and the elected and executive branch officials who pressed this matter. See also, story titled "WTO Panel Concludes US DRAM Countervailing Duties Order Violates SCM" in TLJ Daily E-Mail Alert No. 1,080, February 22, 2005. 6/27. The Government Accountability Office (GAO) released a report [74 pages in PDF] titled "File Sharing Programs: The Use of Peer-to-Peer Networks to Access Pormography". Most of this report consists of briefing slides. The report was requested by Rep. Tom Davis (R-VA), Rep. Mark Souder (R-IN), Rep. Chip Pickering (R-MS), Rep. John Shadegg (R-AZ), and Rep. Joseph Pitts (R-PA). 6/27. The Government Accountability Office (GAO) released a report [78 pages in PDF] titled "Critical Infrastructure Protection: Department of Homeland Security Faces Challenges in Fulfilling Cybersecurity Responsibilities". The report finds that while the Department of Homeland Security (DHS) "has initiated multiple efforts, it has not fully addressed any of the 13 key cybersecurity-related responsibilities that we identified in federal law and policy, and it has much work ahead in order to be able to fully address them." For example, the report states that the "DHS has not yet developed national threat and vulnerability assessments or developed and exercised government and government/industry contingency recovery plans for cybersecurity, including a plan for recovering key Internet functions." The report also finds that the "DHS continues to have difficulties in developing partnerships -- as called for in federal policy -- with other federal agencies, state and local governments, and the private sector." 6/27. The U.S. Supreme Court denied certiorari in McFarling v. Monsanto. See, Order List [11 pages in PDF], at page 4. This case involves the relation between antitrust and patent law. Last week, on June 20, the Supreme Court granted certiorari in Illinois Tool Works v. Independent Ink, another patent tying antitrust case. See, story titled "Supreme Court Grants Certiorari in Patent Tying Antitrust Case" in TLJ Daily E-Mail Alert No. 1,158, June 21, 2005. The Department of Justice's (DOJ) Office of the Solicitor General (OSG) wrote in its brief that the two issues in this case are "1. Whether a licensee may validly assert the defense of patent misuse in an action for breach of a patent-licensing agreement when the license allowed him to plant seeds embodying patented technology only for the purpose of growing crops for resale as a commodity, and not to save any new seeds (also embodying the patented technology) for replanting", and "2. Whether a patentee engages in tying, in violation of Section 1 of the Sherman Act, 15 U.S.C. 1, when it allows the licensee to plant seeds embodying patented technology only for the purpose of growing crops for resale as a commodity, and not to save any new seeds (also embodying the patented technology) for replanting." This case is Homan McFarling v. Monsanto Company, Sup. Ct. No. 04-31, a petition for writ of certiorari to the U.S. Court of Appeals for the Federal Circuit. 6/27. The U.S. Supreme Court denied certiorari in WH-T.V. Broadcasting v. Zenith. See, Order List [11 pages in PDF], at page 4. This is a contract dispute involving the sale of television set top boxes, the availability of consequential damages for breach of contract, and the doctrine of Hadley v. Baxendale. This denial of certiorari lets stand the judgment of the U.S. Court of Appeals (7thCir). See, opinion [PDF] of January 20, 2005. The Appeals Court affirmed the District Court's summary judgment for Zenith. See also, story titled "7th Circuit Rules in Zenith v. WH-TV" in TLJ Daily E-Mail Alert No. 1,060, January 21, 2005. This case is WH-T.V. Broadcasting Corporation v. Zenith Electronics Corporation, Sup. Ct. No. 04-1514, a petition for writ of certiorari to the U.S. Court of Appeals for the 7th Circuit. The Court of Appeals case is Nos. 04-1635 & 04-1790. 6/27. The Supreme Court denied certiorari in Hewlett-Packard v. Donald Jebian, No. 03-1202, an Employee Retirement Income Security Act (ERISA) case. See, Order List [11 pages in PDF], at page 4. See also, brief of the Department of Justice's (DOJ) Office of the Solicitor General (OSG) urging the Court to deny certiorari. 6/27. The Supreme Court denied certiorari in Rates Technology, Inc. v. Nortel Networks, No. 04-1559, a patent infringement case involving the issue of personal jurisdiction. See, Order List [11 pages in PDF], at page 5. See also, opinion [14 pages in PDF] of the U.S. Court of Appeals (FedCir). 6/27. The Federal Communications Commission (FCC) released a notice regarding cell phone jammers. It states that "Advertisements for cellular jammers suggest that the devices may be used on commuter trains, in theaters, hotels, restaurants and other locations the public frequents." The FCC notice adds that "Inquiries about the use of cellular jammers are often accompanied by comments that the use of wireless phones in public places is disruptive and annoying." The FCC notice states that the Communications Act and the FCC's rules "prohibit the manufacture, importation, marketing, sale or operation of these devices within the United States". This notice is numbered DA 05-1776. Go to News from June 21-25, 2005.